It Doesn't Matter Where You Begin... It's Where You End Up, That Matters! 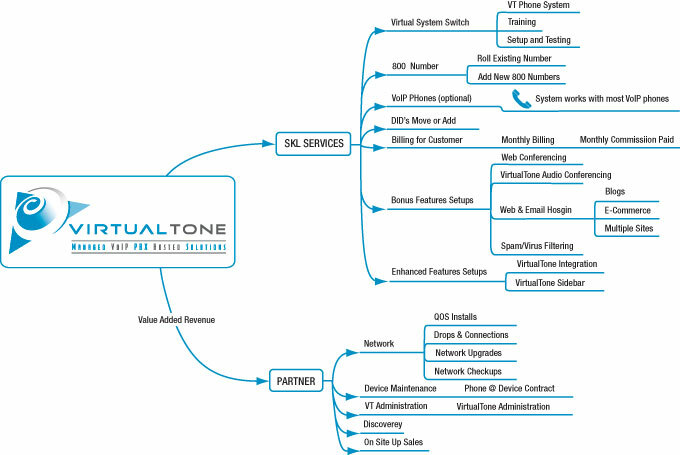 With VirtualTone you do not have to worry about having dedicated phone systems in stock and technical experts on staff to install, setup and train your clients. Not to mention the global VoIP to PSTN network and the web hosting network needed in order to make it all happen. VirtualTone has you covered! No matter what size your client is. After that our technicians can handle everything for you and you can make commissions or take control and charge the customer your rates. As a VirtualTone Partner the choice is yours. This exciting new partnership is guaranteed to bring residual profit to your companies net income. To help us speed up the partner application process please fill out the additional information below. If so what is the name? Do you have any questions? If so please let us know.